Need new apps for your favorite device? Here are 45 iPhone, iPad and iPod touch apps that just hit the App Store. 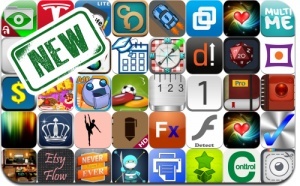 This new apps alert includes ▻Solitaire, Soctics League, Rbots, EveryCollegeCal, Doodle Car Racing, Planet Tracker, Dance Journal, InstantAlbum, Dare Ya, Dance Journal, Draw Book Mobile, Dazzup, and many others.